One of the challenges with operating a service desk is perception. From a customer perspective it can be a bit of a black hole, requests go in and some service is provided. During my tenure on a service desk I was at a corporate function where I was sat next to someone from the business. I introduced myself and when they asked what I did I told them that I worked on the service desk. 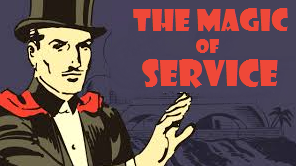 Their eyes widened, and they said, “I always wanted to know how you managed all the work that came in, does it depend on job title or what?” I felt a bit like a magician not wanting to give up all the secrets to the apparent ITSM magic while still explaining them that there was some method to the madness. It was when I was formulating my response that I thought to myself do we do this the best way possible? It was at that time a waiter came along with beverages and my curious business person moved on to other topics with someone else. However if we were in a position to manage the queue by order of operations based on service perhaps the more time constrained requests would get done in a more timely manner and ones that could wait would. To do this however you have to have a good understanding of the service. You also have to have a good grasp on the impact that requests or incidents have on the service. For example if our ticketing system for requests was geared to have a default priority of ‘medium’ and no one altered it the queue, all requests would all be equal priority in essence, thus FIFO . But if we based our triage on service we may be better able to filter items based on services and business requirements. Of course there is always a risk here. In this case we not only have to know what the service does and how it impacts the ability for your business to function, but we have to need a process to review that the service is current, that its status reflects business need and that how we provide service is meeting the expectations of those we provide it to. Keeping current is as much heavy lifting as implementing. This is where we need to ensure that we as a service provider review how well we are doing. While the service desk is the first point of contact, the rest of the support functions also have a vested interest in the way we provide service. The benefits of really understanding the service will better position IT to quantify what it costs to provide that service. This valuable metric will allow us to work with the business to ensure we have the right resources, whether people or otherwise to continue to provide excellent service delivery and improve on that over the course of time.